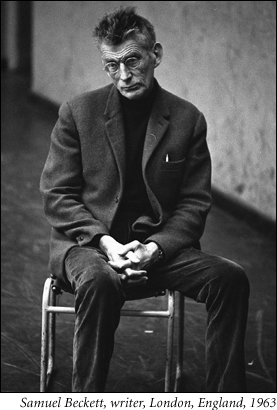 In 1969, the Irish-born writer Samuel Beckett (1906-1989) published the piece of short prose Sans in French. One year later, in 1970, it was followed by a translation (by Beckett himself) into English titled Lessness. An interesting characteristic of this work is its combination of dense aural and structural patterning and apparent randomness. Both versions consist of 24 paragraphs containing a total of 120 sentences. Each sentence occurs twice: once in the first half of the work and once in the last. Beckett later indicated to critics that the order in which the sentences in Lessness appear had been determined randomly by drawing little slips of paper out of a container. This web site lets you generate alternate versions of Lessness according to the same rules that Beckett originally used. The site is intended as a research tool for the academic community – to help explore the space of ‘possible Lessnesses’ – and generally to further interest in Beckett's work. To arrange the sentences, the site uses true randomness from RANDOM.ORG (a source of randomness generated with atmospheric noise) rather than the pseudo-randomness often used in computer programs. The project was completed in 2000 when the authors were doing their PhDs at Trinity College, Dublin where Beckett studied from 1923 to 1927 and lectured from 1930 to 1931. Access to the site is free, but restricted due to copyright considerations. To obtain the password, please contact lessness@random.org.